Today is my last day of work - for a while anyway - while I go on maternity leave. My colleagues are having a great baby shower lunch for me at work. I feel so big, it seems I can barely move - was I this huge last time? 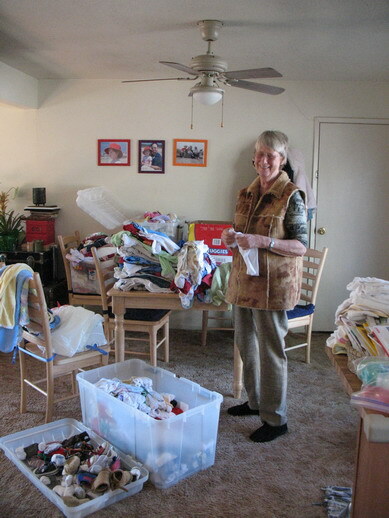 But now Mom is here to help sort through all of Anika's old baby clothes and the great hand-me-down clothes friends have given me - we sure have a lot of usable clothes to sort and wash.
Hmm, I think I'm leaking fluid...like with Anika. Not sure, but something is different from yesterday. I call my Doctor who tells me to go to the Hospital right away. This is it I think! We send Anika to daycare for now, call Robert and head to the hospital. The nurses check me for fluid, but it seems to be a false alarm, they send me home. Bummer. 10 days since Mom arrived and for 10 days I've been telling "the Baby" to get out! I'm done with being pregnant! Anika was born nice and early, however pretty big, so I'd like to have this Baby sooner rather than later. So I have another appointment at the Doctor this morning and manage to talk him into inducing me on Friday, 2/2/07. Finally, end is in sight! I go home, and go about our normal business when around 4 in the afternoon, my water breaks. No doubt this time! While I figure out how I'm going to get to the hospital (yes, that much water...) I call Robert, who is - was - on a 2 day training seminar in Sacramento to please come home and I call Peter, to watch Anika, so Mom can take me to the hospital, since there is not enough time to wait for Robert. While we get comfy at the hospital, Robert arrives, having convinced Peter to watch Anika for a little bit, my contractions start. We get the epidural going pretty quickly, since that worked so nicely last time, at this time I'm expecting a quiet and eventless night, aided by the epidural. The way the administration of the epidural went should have tipped me off - last time that was a 10 minute, painless procedure - it took the Doc about 6 or 7 not exactly painless tries to get it going properly. I'm trying to concentrate on the contractions, but it still hurt. Robert and Mom are pretty upset. Since we now expect a similar experience as with Anika (sleep all night, have baby mid-morning), Mom heads home to relieve Peter, Robert gets comfy on the sofa, I get comfy to get some sleep. I think its around 9 pm or so. I wake up around 11pm itching and in pain from the contractions, unexpectedly. Seems like I'm having a reaction to the epidural, so I'm given Benadryl to stop the itching, and since that is put straight into my IV, I'm asleep within minutes. I wake up - again - around 1 am or so, more pain, still itching. Hmm. The Nurses ( who are from Mississippi and Louisiana, including the accents and all, btw) check me and I'm fully dilated, so we get to wake up the Doctor, who arrives within the half hour. My contractions are actually painful, despite the epidural, but manageable. After about 45 minutes of pushing, Jonas is born. I almost can't believe he's finally here.